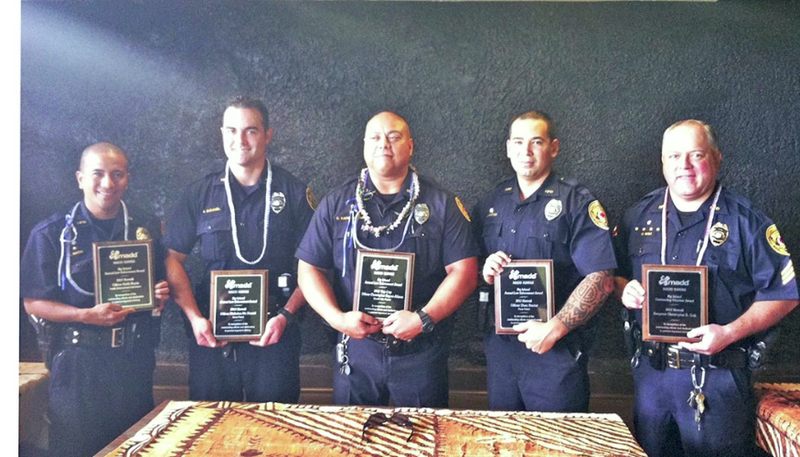 Left to right: Officers Keith Nacis, Nicholas McDaniel, Christopher Kapua-Allison, Shea Nactor and Sergeant Christopher Gali. 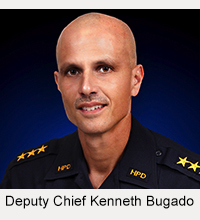 At their annual Law Enforcement Awards, Mothers Against Drunk Driving Hawaiʻi and Big Island Toyota honored Big Island police officers Monday (November 18) for their outstanding efforts and dedication to preventing impaired driving and reducing underage drinking. The awards were presented at a ceremony at The Luau House in Hilo. Officer Nicholas McDaniel, Kona patrol, 21. 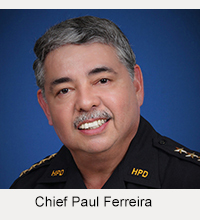 The “Top Cop” award went to Officer Christopher Kapua-Allison of South Hilo patrol with 104 arrests. Additionally, Sergeant Christopher Gali of the Traffic Enforcement Unit, Area I, was awarded the Big Island Outstanding Volunteer Award.